It happened in an instant: the mallards that had been committed to the decoys flared at my movement, but not before a migrating greenhead folded at the bark of the gun and fell onto an ice floe. Daisy, my yellow lab and hunting partner, bolted from the natural cover of cattails and plowed into the slushy water. Her zeal for the hunt and the retrieve combined with an error in judgment on my part, erupted simultaneously to embroil her in a life and death struggle that I could only watch from the safety of the shore. Why is it that stories like these and movies like Old Yeller elicit such an immediate, deeply emotional response? A dog is just an animal, right? On the contrary, after raising multiple litters of gun dogs with my family, training several dogs from scratch, and spending days trailing behind them in Montana’s fields and marshes, I’d have to say that a gun dog is a lot more than that. What is a Gun Dog? Gun dogs have been bred and raised over the decades specifically to hunt and perform in the field. Responsible gun dog owners continue these traditions and create environments for their dogs to succeed. Although this may sound a bit stuffy, the end result is that gun dogs and their owners have, arguably, more fun together than any other pairing of canine and man. Fun it may be, but hunting the plains, coulees, and mountains in pursuit of upland birds can be a seriously strenuous endeavor. Although gun dogs are bred for the challenge, they benefit from training and conditioning in the same way that we do before running a marathon. Jim Bumgarner, owner of Rimrock Valley Preserve and longtime dog trainer, uses his dogs in the field more in a year than most of us will in a lifetime. He follows a varied, but refreshingly simple, program for season-long success. “Although there’s no replacement for time spent training in the field”, he says, the off season finds him exercising his dogs on long walks and runs in varied terrain to build their endurance and harden their feet. “There are not many injuries common to working dogs if you keep them in shape,” he says. That being said, a variety of occupational hazards, ranging from irritating to life threatening, do exist for working dogs. Porcupines, for example, are an ever- present hazard to gun dogs and one of which Courtney Funderburk (Signature Montana 2015 Hunting Bird Dog Photo Contest winner) has extensive knowledge. Curious dogs can quickly end up with a face full of quills, which can create an immediate canine emergency. According to Funderburk, electronic collars (E collars) are a valuable tool for keeping gun dogs away from porcupines or minimizing damage if your dog is tangling with one. “E collars simply break the concentration of the dog when they are not paying attention to the task at hand or are getting mixed up with porcupines,” she says, which allows the handler to intervene. Snakes, thorns, barbed wire fences and a myriad of other hazards can present themselves each time a gun dog is in the field, but the right combination of breeding, training and handler intervention usually prevents problems from occurring. Working gun dogs require a combination of high protein, no-filler dog food and regular hydration, both in the kennel and the field. Bumgarner feeds his dogs an all natural, salmon-based dog food to which he adds coconut and fish oils. Funderburk agrees on the need for high quality dog food, and also stresses in-field hydration as essential to the daily success and safety of the English Setters she hunts. Because of their small body size and the energy they expend during put into the hunt, Setters are susceptible to hypoglycemic events. Knowing this, Funderburk carries two water bottles of sugar water per dog to keep them hydrated and their sugar levels in normal range. This high level of attention to detail and care for both Bumgarner’s and Funderburks’s dogs has resulted in healthy hunting dog partners that love what they do. A well-trained gun dog and master perform like a well-oiled machine when things go as planned, although some of the most memorable times occur when things don’t. Because this is true, all of us have a favorite dog, and Jim’s was Libby. “The Lord made her perfect,” he said, during a sit down after hunting Rimrock. She died through imperfect circumstances, doing what she loved, but the memories of the, wonderment and flat-out fun Jim had with her will last his lifetime. This is the essence of the gun dog–an animal in whom we invest hours of training, patience and persistence, in exchange for their love, effort, and years of fun together in the field and home. 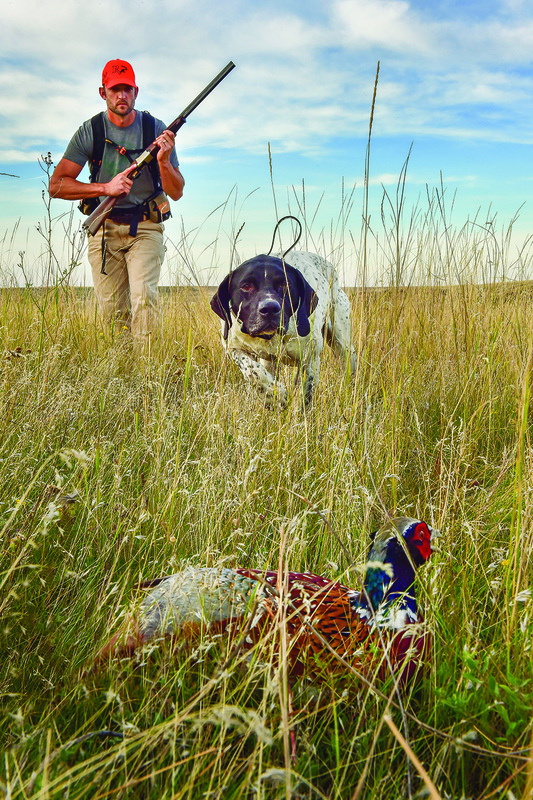 This is why we hunt and partner with them, and why we honor the gun dog in this issue of SignatureMT. Shane Klippenes is a career Fire Captain/Paramedic with a love for backpacking and exploring the lesser known corners of Central Montana with his wife and three teenage daughters, who are constant reminder of what is truly important in life.